Oliver Strand wrote in a recent New York Times article that coffee can be either something you make or something you drink. One coffee roaster in Austin, Texas believes coffee can be both. Roster Joe Lozano and Manager Clay Roper combine the nuances and artistry of making coffee with the palate and gustatory delight of drinking coffee. Telling the story of how they accomplish this is one of their favorite pastimes. Third Coast Coffee Roasting Company occupies an unpretentious space in a small office complex outside of the bustle of downtown Austin. Although the company has a small coffee bar and a wall of coffee mugs to entice coffee drinkers, the place appears to be all about the making of coffee. Pallets of green coffee beans arrive from Cooperative Coffees, a collective of 24 roasters who purchase coffee according to Fair Trade relationships with their farming communities. 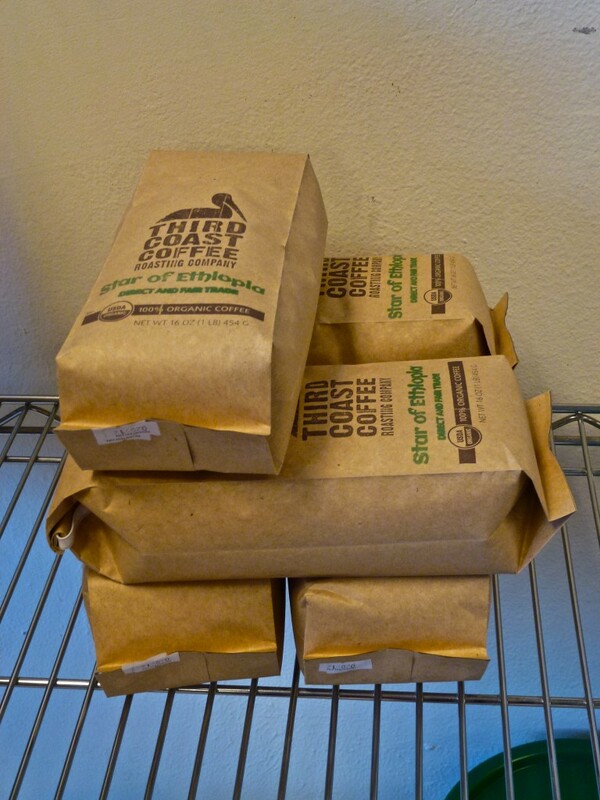 Stacks of jute bags display the Cooperative Coffees logo and a description of the beans inside each bag. The five employees of the company take care to select, taste, re-taste, and taste again samples of beans that come from their growers. This process of tasting is called cupping by those in the trade and transforms Third Coast Roasting Company into a producer of something you drink rather than make. Clearly, Mr. Strand failed to imagine that some roasters could be occupied with both the making and drinking of coffee. Once beyond the small coffee counter, a large floor-to-ceiling world map belies their main passion, the connection between the drinking and the producing of their coffee. 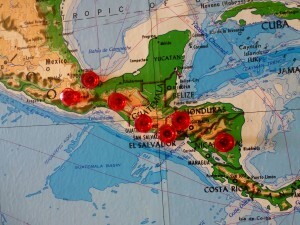 Bright red pushpins mark each grower, most huddled in Central America, then down to South America, and a few sprinkled in Africa and Indonesia. And as if a colossal map weren’t enough to make their point, the roasters link their website to each of their growers through Know Your Grower (You’ll need Google Earth to view this). 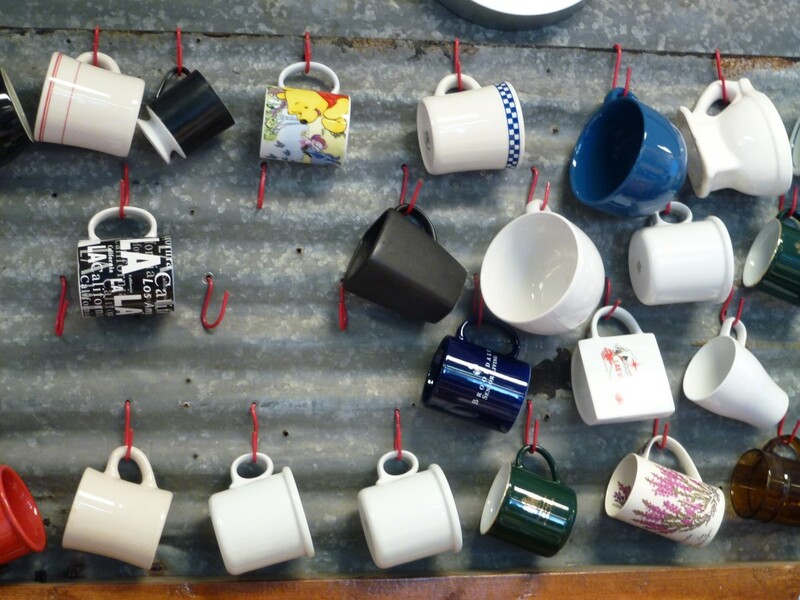 For these roasters, the urge to connect people to their coffee is irresistible and everywhere you turn you’ll find traces that lead from cup to country … and a little red pushpin. Linking drinking to making coffee, the roasters work several roasting machines in the back of their space. Plastic buckets of green beans marked with flags of their country of origin line up aside each roaster, waiting the approval of Joe, the master roaster, as he fiddles with his roasting “recipes” on his laptop computer perched aside the active roasting oven. Joe’s background in the food business shaped his approach to roasting. He thinks of beans as food, assessing his roasts according to a bean’s texture, greenness, and a multitude of other characteristics that coffee aficionados boast about during their cupping sessions. Self-taught and intensely engaged with his custom roasts, he says he appreciates the knowledge a roaster builds up and would like someday to spend more time with the growers, enabling more collaboration and education within the coffee bean community. Admiring his completed lists of roasts on the day of my visit, Joe swung open the overhead door next to his ovens and stood in the sunshine that poured into his shop after three days of rain. His looked up, took in the fresh air, and returned to bagging the just-roasted beans for wholesale customers, restaurants and farmers markets. The combination of making and drinking coffee seems easy for these roasters. This entry was posted in Food Warrior Interns, In the Pantry (food artisans) and tagged coffee, cooperative coffees, food warriors, Real Time Farms, robyn metcalfe, third coast coffee. Bookmark the permalink.